Fangirls, are you sick of me talking about fitness? I’m fairly certain that everyone on my twitter feed is. Today was the second day I used the Couch to 5K app, and I’m feeling so good about it, that I’m already raving to all of my coworkers about it, so I figured I give you ladies (and gents) my thoughts as well! Couch to 5K is an app that does exactly what the name tells you it will; it trains you for a 5K. The app claims that in 9 weeks, you will be able to jog a 5K (a race hat’s 3.21 miles long), after being a lazy bum. I have never been a runner. When I was in middle school I played field hockey for two years, but stopped come high school because of the constant running. In high school I played tennis, which seems like a lot of running, but it’s just sprints (short bursts of speed), and when it’s over you get to sit and cheer your teammates. I also did the field portion of Track and Field in high school; I ended up being one of our top female throwers (I threw discus and shot put). But I have always loathed running. A big part of my incessant hatred of running probably comes from my mum, who is an avid, excited runner. She does trail and distance runs in the summer, and uses the gym when she can’t run outside (but the woman has braved some weather going on runs, so it’s usually outside). I have had many issues with my mum, and running was associated with her. There is, however, also the facts that I feel like I’m coughing up blood and will never breathe again that make me despise running. But I digress. Since running has never been in my wheelhouse, downloading Couch to 5K was incredibly intimidating. I paid that $1.99 feeling like a big spender, but then was nervous to open the app. When I did open it, I found that the interface was nice and friendly; bright colors, a kind “trainer,” and an easy, open training plan for 9 weeks. Then I started thinking more about it; Disney has 5ks. If I had a goal, it would probably be easier, right? So I have my heart set on the Avengers 5k in California, but will someday do the Food and Wine 5k and 10k, because I have heard that running is a lifetime sport. So why limit myself to just a 5k? Like I said earlier, I’m only two days in, so I’m definitely getting ahead of myself. But goals are incredibly important for me. After having my goals set high, I went with my mother to buy a sports bra and running sneakers; it cost about $150 for just one bra and one pair of sneakers, and that made me realize, hey, if you’re spending all this money, you need to commit to this. So I am. I’ve run two of my three days this week, along with my daily strength training. And the best part is, I don’t feel like I’m going to die while running. 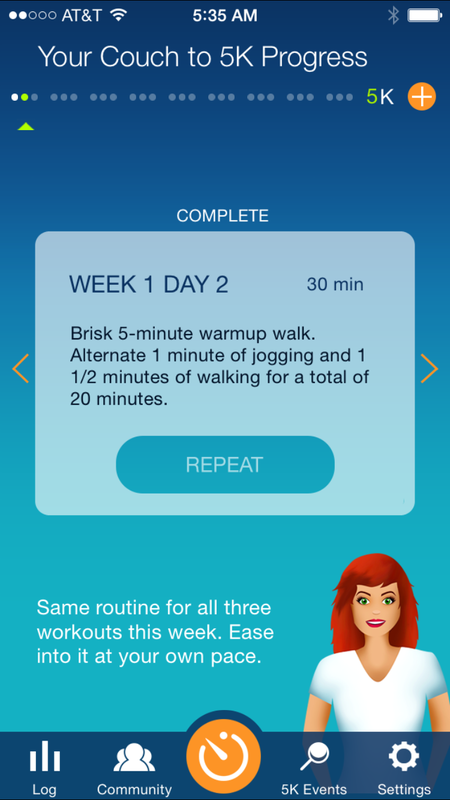 The first week’s runs include a 5 minute brisk walk, then alternate between 1 minute of running, and 1.5 minutes of walking. You alternate for 20 minutes, then have a 5 minute cool down walk. The app sends you voice and text notifications when it’s time to switch and when you’re halfway through, which is crazy helpful. I put in my earbuds, set it up, and go. I’m still pretty darn intimidated by running more, but we’ll see how it goes. I’ll be updating everyone here, and on my twitter and instagram, so feel free to follow along. 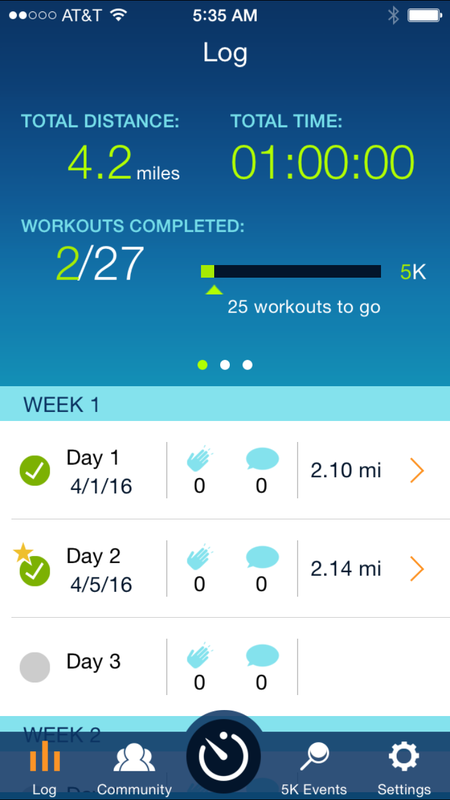 I definitely recommend Couch to 5K, and am excited to be using it.